From pricing and specs to hands-on and FAQs, find it all here. Updated Dec. 7: We've updated this story with the price of the Surface Pro (2017) with LTE. See "Price and release date" below for more details. 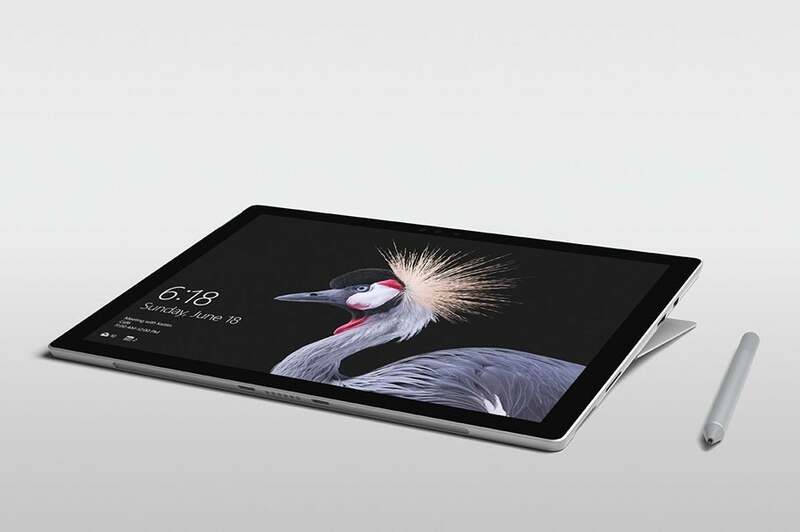 With the the Surface Pro (2017), Microsoft has rebooted its flagship Surface product, one of the leading 2-in-1s in the category. It’s also shedding the numerical designations of prior products. If you’ve owned a Surface Pro 4, however, you already have a good idea of what Microsoft has in store for you with the new Surface Pro. We’ve assembled everything we know about the new Surface Pro: the price and release date, the specs, and our official review. We’ve also answered some of the questions we think you’ll have about Microsoft’s new device. You can preorder the Surface Pro now. 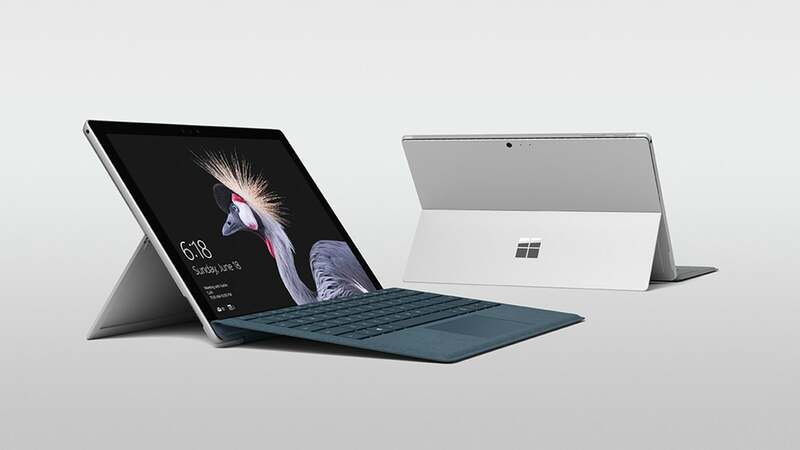 As of June 15, you can now order all but the two most powerful Core i7 models of the Surface Pro—the 16GB RAM/512GB SSD and the the 16GB RAM/1 TB SSD. According to Microsoft, those models were previously scheduled to ship on June 30, but Microsoft has removed the estimated shipping dates. Otherwise, the Surface Pro will launch in 26 markets—including the United States, the United Kingdom, France, Germany, India, Taiwan, and more. Our news story from the Surface Pro launch has many more details. Microsoft’s Surface products have never been cheap, and the Surface Pro’s base model is $100 more expensive than the base model for the Surface Pro 4. Keep in mind that the prices below include the Surface Pro tablet only. Microsoft doesn’t bundle it with any accessories at all, not even a keyboard, unless there’s a special promotion. Graphics were not specified in the specs, though we're assuming it'll be Intel HD Graphics 620, as with the existing Core i5 models. Microsoft’s Surface Pro Signature Type Cover ships in three colors. Though you can use a Surface Pro as a simple tablet, you’ll almost certainly want to buy some of the accessories, all of which cost extra. Keyboard: We’ll start with the one everyone will want—a Type Cover keyboard. 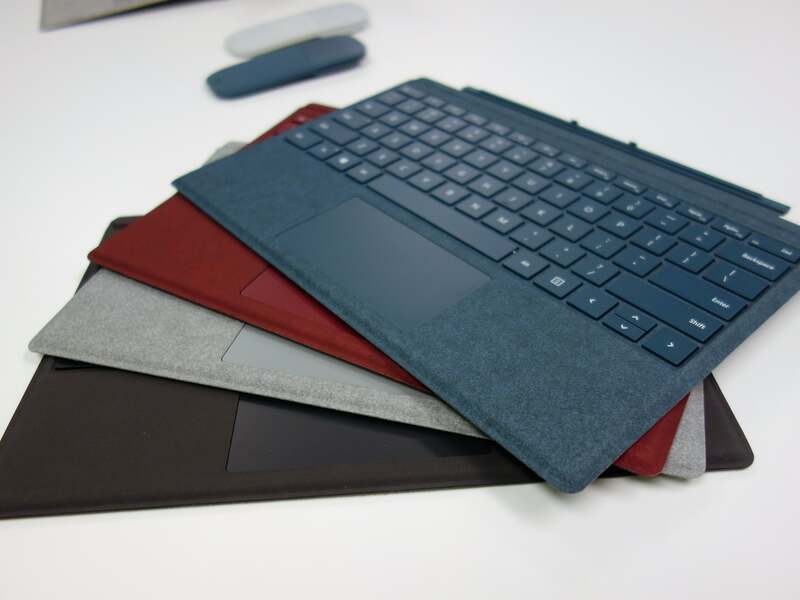 Microsoft offers two: the Surface Pro Signature Type Cover ($159), clad in fancy Alcantara fabric, and the primarily plastic Microsoft Surface Pro Type Cover ($129). 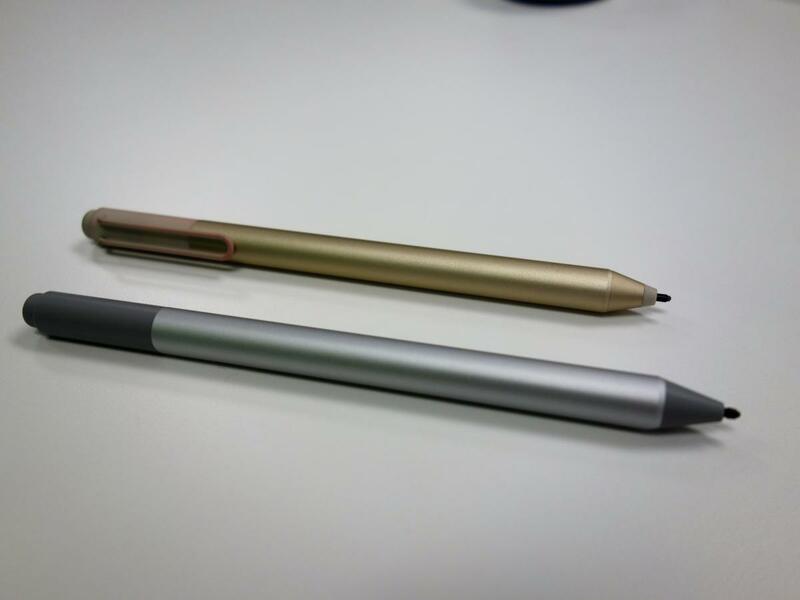 Pen: Unlike the Surface Pros 3 and 4, Microsoft doesn’t include a new Surface Pen, which costs $100 extra. Both the Pen and Signature Type Covers ship in three colors: platinum, burgundy, and cobalt blue. The generic Surface Pro Type Cover is available only in black. 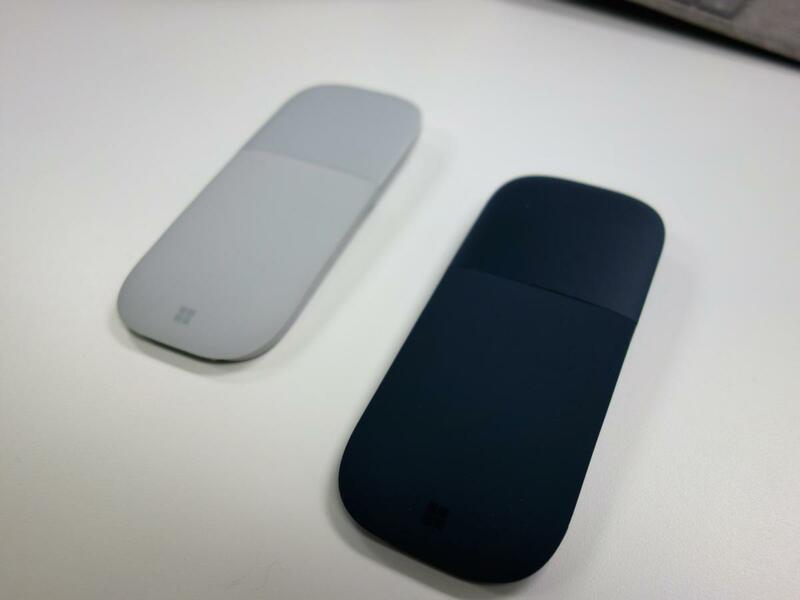 Mouse: Though both Type Covers include a trackpad, an optional Surface Arc Mouse will be available at launch for $80. Surface Dock: The Surface Dock, a port expander which adds four additional USB ports and two miniDP connections, is $200. While it’s not available now, Microsoft says it will ship a version of the Surface Pro with integrated LTE later this year. A version with the new Windows 10 S operating system, rather than the usual Windows 10 Pro, is also planned. Two of the optional Surface Arc Mice. In PCWorld’s review of the Surface Pro we gave the flagship 2-in-1 3.5 out of 5 stars, chiefly for three reasons: the excessive price of our review unit, the incremental improvements over the Surface Pro 4, and the quality of the competition. The performance improvements offered by the new Kaby Lake CPU and Iris Plus graphics are marvelous, but it's hard to swallow high prices that do not include a Type Cover or a Surface Pen (both pricey in their own right). The Surface Pro seems nearly identical to the Surface Pro 4, but the differences in CPU, graphics, and features do matter—for better and for worse. Watch our review video to see more. When Microsoft announced the Surface Pro on May 23, it was touted as a "laptop" despite its obvious lack of an included keyboard. 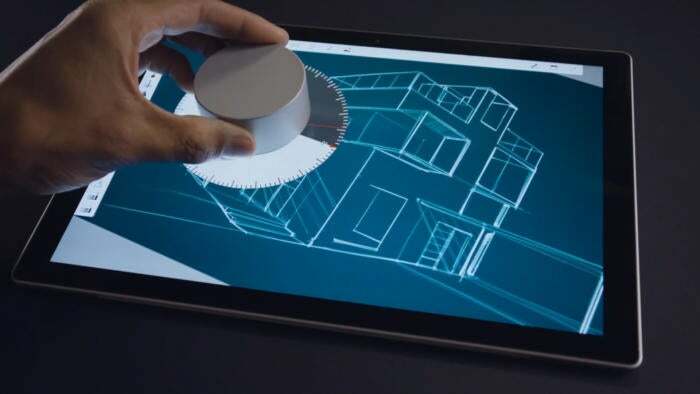 Wordplay aside, Microsoft's videos of the product (we've compiled selected shots below) show off the sleek design, the inking capabilities, and the ability to use the Surface Dial on the display (though as our review mentions, it takes up a lot of space on the screen). All of the Core i5 and Core i7 chips used in the new Surface Pro are from Intel’s most recent, seventh-generation (Kaby Lake) family of CPUs. Microsoft says the processors offer 20 percent more performance than the Surface Pro 4, 2.5 times more computing performance than the Surface Pro 3, and 1.7 times the compute power of Apple’s iPad Pro. Naturally, those results vary by benchmark; see our Surface Pro (2017) review for details. In some cases, the Surface Pro (2017) performance is even better than expected. Microsoft also says the Surface Pro will last for 13.5 hours of continuous video looping, up from 9 hours with the Surface Pro 4. Microsoft uses different metrics than we do for its video rundown test, but we’ve found the battery life to be closer to 8 hours. It’s important to note that the thermal throttling that was present in the Surface Pro 3 (but not in the Surface Pro 4) has returned. Microsoft told us they expect throttling of about 20 percent; we saw more, into the 30-percent range. That prompted Microsoft to suggest that they may have shipped us a defective system, and we’ve agreed to re-run our tests. Microsoft’s reboot of the Surface Pro name follows Hollywood’s trend of “rebooting” movies, from Godzilla to Spider-Man to Ghostbusters. It’s all a bit confusing, so we’ll try to clear up some of the mysteries. Why isn’t it called the Surface Pro 5? Our understanding is that Microsoft wanted to refocus itself on the Surface Pro lineup, making a clean break from prior models. It forces us (and you) to use the awkward Surface Pro (2017) terminology, though. Who should buy the Surface Pro? Two years ago, the Surface Pro would have been the tablet for the masses. Now, perhaps in an attempt to distance the Surface Pro from a struggling Windows tablet market, Microsoft’s calling this a “laptop,” even though the keyboard is an optional accessory. We wish Microsoft would let go of this baffling conceit. In any case, if you’re a mobile professional, the new Surface Pro may be for you. The tablet is also powerful enough to play some older games at acceptable frame rates, though this shouldn’t be the primary reason to buy it. Which Surface Pro should you buy? Obviously, you'll need to select a version that meets your needs and your budget. In my mind, though, the $1,299 Core i5/8GB RAM/256GB SSD offers a value proposition that's more in line with the competition. If you opt for one of the Core i7 variants, though, you'll also receive the Iris Plus graphics core as part of the package, which boosts its GPU capabilities dramatically. What are PCWorld’s first impressions? After I first used it at a briefing, I can say it seems to be a beefed-up Surface Pro 4. Slightly more rounded edges and more recessed cameras are barely noteworthy. I like the kickstand, which reclines a full 165 degrees. Microsoft calls this “Studio Mode” because it mimics the Surface Studio, the Surface Pro’s all-in-one cousin. Over the course of our review, I really liked the performance Microsoft built into the Surface Pro with the Iris Plus graphics. Otherwise, if you’ve used a Surface Pro 4, this will be familiar territory. If you want a more traditional notebook, consider the Surface Book or Surface Laptop instead. How does the Surface Pro differ from the Surface Pro 4, the Surface Book, and the Surface Laptop? Surface Pro 4: The Surface Pro improves upon its predecessor in a few key ways. The updated Kaby Lake CPU boosts performance and battery life. The wider range of the kickstand adds functionality, including the ability to use the Surface Dial. Surface Laptop: If you’re looking for something comparable to the Surface Pro in a true notebook form factor, you should check out the Surface Laptop. Note that its operating system is the classroom-focused Windows 10 S, but it’s upgradable to the same Windows 10 Pro that the Surface Pro uses. Surface Book: Like the Surface Pro, the Surface Book is a two-in-one with a detachable keyboard. The Surface Book offers a lot more oomph, however, especially with the associated Performance Base. It’s the only Microsoft notebook or 2-in-1 with discrete graphics, too. How much does the Surface Pro cost? Prices range from $799 to $2,699, and that’s just for the tablet. You’ll probably want to buy either a Surface Pro Signature Type Cover ($159) or the Microsoft Surface Pro Type Cover ($129) as a keyboard, and then the optional $100 Surface Pen. A Surface Dock ($200) is another possibility if you want additional ports. The Surface Pro (2017) is a Surface Pro, plain and simple: tablet, magnetically-attached Type Cover keyboard, kickstand. If you were to put a Surface Pro next to a Surface Pro 4, about the only way to tell the difference would be to look at the attached Surface Pen, which lacks the clip of its predecessor. The new Surface Pen (below) features 4,096 levels of pressure sensitivity, about double that of its predecessor (above). I was impressed by the greater range of the kickstand. I’m not sure potential buyers will care as much as I do about the fact that you can now use the Surface Dial peripheral onscreen, though it’s a nice touch. For a deeper look, please see our review of the Surface Pro (2017). While the Surface Book offers a bit more physical space to pack in battery and discrete GPUs, the Surface Pro maintains an emphasis on portability. The key upgrade for the Surface Pro refresh are the Intel Kaby Lake CPUs, which bring several fundamental improvements in speed and battery life. If you want something a bit slower and a lot cheaper, try the Core m model: The performance should be satisfactory for basic office tasks. Memory options will vary, depending on your choice of Surface Pro (2017). Note that there is no 8GB option for the Core i7 at this time. Our review unit included a Samsung KUS040202M-B000 NVMe drive, providing among the fastest read speeds we’ve tested: 1,702 MBps. The Surface Pro offers only integrated graphics. Graphics performance will increase along with processor power. But the Surface Pro is one of the only tablets or notebook we’ve seen with the Iris Plus graphics core inside. The new Surface Pro’s keyboard features 1.3mm of key travel, slightly less than the 1.5mm of travel used by the Surface Laptop. If you buy the Surface Pro Signature Type Cover, you’ll get an Alcantara-clad deck that’s laser-cut to fit snugly around the keyboard keys, in either platinum, burgundy, or cobalt blue. Otherwise, you can buy a standard Type Cover, in black. Though the Surface Pro uses Windows 10 Pro, Microsoft says a version of the Surface Pro will ship later on with Windows 10 S installed. Somewhat surprisingly, Microsoft has chosen to stick with its established Surface Connector for charging, rather than use USB-C. Supposedly, that’s for reasons of backward compatibility with existing Surface chargers, as well as in response to people who complained that the micro-USB-powered Surface 3 took forever to charge. The right side of the tablet houses the three main ports: the Surface connector, USB-A, and the microDP port. 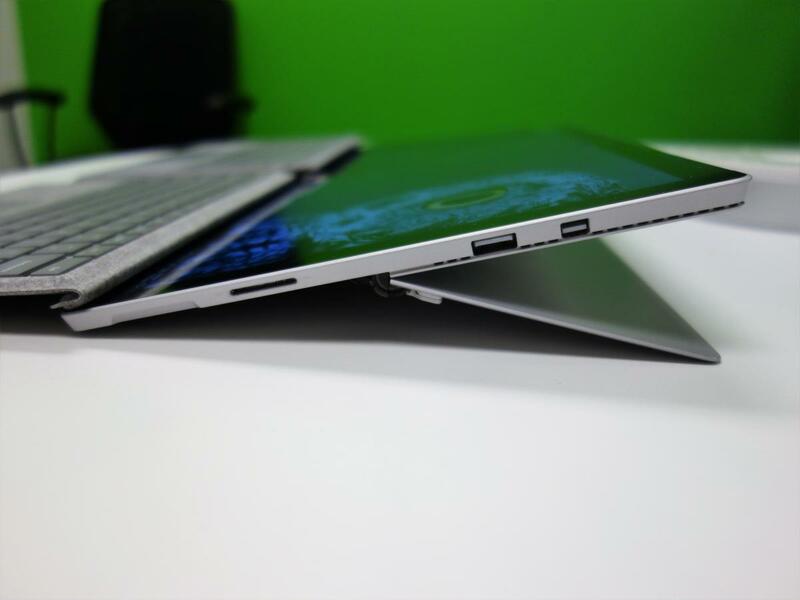 Like other Surface devices, a microSD slot hides behind the kickstand. Microsoft rates the Surface Pro’s battery life at 13.5 hours, just an hour shorter than the 14.5 hours claimed for the Surface Laptop. Microsoft bases its claims on video rundown tests, the same metric PCWorld uses. We found the battery life of the Surface Pro (2017) clocked in at just over eight hours, however, probably due to the brightness settings we used while testing. 2.37 pounds to 2.41 pounds, with Type Cover. The exact weight will vary by model. The Core m model is the lightest.